dates, almonds, organic apple, pecan nuts, cinnamon, almond oil, nothing else! may contain small pieces of nut shell or fruit pit. Our grain-free bars are made with 100% Real Food. We don’t use dried fruit that contains vegetable oils, sugar or sulphites as commonly found in other snack products. 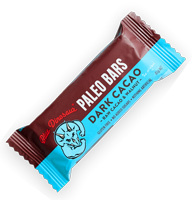 All our bars are made with 4-6 Real Food ingredients. They are hand made and cold pressed. All the bars are gluten, grain, refined sugar, soya, dairy, GMO and vegetable oil free. We have managed to source organic cherries that are free from vegetable oil and sugar -as commonly found in other dried cherries. We also use an organic coconut which doesn’t contain sulphites (preservative) which is commonly used in dried coconut products. These are amongst the best tasting simple energy bars we've ever had. We love the simple ingredients as well.